Ah, the combination of technology and food. Well sortof. After dusting off my Canon S3is for it's timelapse feature for Inkinga few weeks ago, and then in the same post complaining about not getting anything faster than 1 shot a minute out of it, I decided to try and make the 555 IC based camera trigger. The version I build was covered in MAKE Magazine Issue 15, as well as a bit more detailed on it's Instructables page. When I described it as "crude" in the Inking rant, I was surprisingly accurate. While I tried to follow the schematics exactly the first two attempts (the first soldering, the second by breadboarding) I still wasn't getting a working device. Perhaps by my mistakes, but perhaps by design flaws. However after going over it's comments on instructables, I managed to hack together a working solution as well as a couple upgrades to the original design. While it's a bit tempting to document my changes, I'll hold off until I either debug it or create another version. 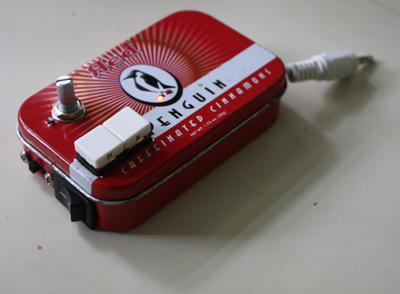 However, after assembling the components, and shoehorning it into an altoids-esqe case, I wanted to use it. While I've come close to using it a few times over the last week or so, I finally used it last night when I made some Bluecheese Burgers. Mix all spices and hamburger together. Divide hamburger and form 8 thin paddies. Put crumbled blue cheese onto 4 paddies, leaving open space on the edges. Place remaining paddies onto the blue cheese piles and "seal" the edges of the two paddies together. Bluecheese Burgers are great on their own, but I prefer them with some Red Onion, slice of Tomato, some Lettus, and a bit of Mayo, but enjoy it however you want to. A few years ago, one of my brothers bought a screen printing kit, the two of us figured out how to print some t-shirts, and planned on doing more with screen printing. Didn't quite happen. The parts have been reused to projects, but screen printing fell off to the side. The cloth prints since then were either one-off with freezer paper stencils and spray paint (similar to this project), experiments for other techniques, to simply being large enough that a professional lab felt more practical than an attempt at DIY printing on a short time table. However, about two weeks ago a friend asked me about printing some flags. He'd used professional printers before, but the low number and small size meant it would have been pretty pricy, and while at first I figured stencils and spray paint would work (and it would) the numbers are enough that DIY screen printing would be easier. So I started working on the kit. Unfortunately parts of it didn't age well. The screen, ink, and tools are in good enough shape, although quite probably not enough, and the photo sensitive emulsion chemicals were either missing, or used. I was also missing the manual. I know, oft ignored, but if you're playing with chemicals its wise to do your research. In this case I turned to Instructables, and landed on the true DIYers screen printing project. While it isn't the most precise article, it's a great guideline, both for people doing it themselves and those who want to save money. So while I was waiting for the Potassium Dichromate / Elmer's glue photo emulsion to dry onto the screen, I started working on the art. In the past I'd dig up a piece of transparency sheet and use that for the mask, but finding any, and not liking the price I deiced to try vellum paper (in large part due to the DIY screen printer instructable). Which gets me to this video. Since I'm working off a vector art piece, I wanted to print it on to the vellum. However my printers don't run on cheap ink, so I only printed out the outline, and would fill it in by hand. Right before I started filling it in I pulled out my old point and shoot and set it up for time-lapse. Since my iBook has been out of service for a few weeks, I've built up a small supply of raw video, and this little movie is the result of it. Last fall, when the leaves were finally changing colors I pointed my camera out the window of my car on my evening commute home then set the footage to music in Leaves as a first attempt at video blogging. Since then I've gotten a little better at manipulating iMovie and with my iBook kind of fixed (and a massive external hard drive attached) I figured it was a good a time as any to make a new video. Anyways, the music is Clouds or Smoke? by Derek K. Miller (PenMachine Podcast) which was released under a Creative Commons Attribution, ShareAlike 2.5 license - same as the video itself. And sorry about the large file size. The compression really kills off a lot of the details I like in the video but H.264 makes it bearable at 320x240. I was really tempted to post a high resolution quality, but I figured 120+ Megs for a 4 minute video is too selfish. Last week one of my brothers was assigned to do some form of commercial for a book (The Kite Runner) for a class. Somehow he got it in his head to do an animated commercial and drop it to tape. Well with his laptops screwed, and a lack of A/V abilities on it anyways, he borrowed me and my iBook to help him do his video. I helped him figure out how to use photoshop, iMovie and Garageband, and did some of the editing, but it's mostly his work. However he did trick me into pulling a technically unnecessary all-nighters to finish it, and cause me a bit of pain when dropping it to VHS, so I'm taking out revenge by posting it onto the interweb. This is the same project that the photoshop doodles came from. I would have done some more with it but my camera battery died and while it was recharging someone bumped into the table something fierce and knocked it over. I like the idea of small time lapse type videos so I'll probably do another on at some point. Just as a side note for anyone getting my videos though RSS, the markw.us/rss feed does not currently support enclosures, it's main purpose is to provide the source for the feedburner feed (which does provide enclosures). Unlike some 'casters I don't have preference for which feed you use, but just be aware that RSS enclosures in the on-site feed will be added on a when-it-happens basis. I've been working on this on and off during my free time all week (with a surprising amount of time taken to make room on my laptop's hard drive) I've finished my Podcastercon 2006 Video (48.3MB 320x240 Quicktime). There are other (higher quality) videos out there, thanks for taking the time to watch this one. Driving from NC to Chicago then coming back all in three days is almost suicidal. It can be done, but its by no stretch of the imagination fun or easy. However, it was important to make this trip this weekend since it was for my Great Grandmother's Memorial service (She lived to be 104 - so don't feel the need to express false sympathies). Its November, and since we're having unusually temperate weather it means the leaves are really starting to show their colors (ironically about two weeks after the areas "Autumn Leaves Festival") so since I've had a hacked up CVS one time use disposable camcorder, a marvelous little goodie that only cost me $30 I decided to start shooting some of the trees. Some of the 15 minutes I took was really good, most of it was rancid to a level far beyond just shaky cam. The 1 and a half minutes that were useable have been edited into a 2 and a three forth minute movie clip with some music. Forgive the cruddy editing in the second half, after the first 90 seconds got edited I wanted to finish the sucker and publish it. I think it still floats around like my mind when I'm thinking, so I doubt I'll go in to recut it if/when I get some more footage. However, right now its 2 AM and I have every intention of falling asleep once this is up. If feedburner doesn't catch it and make it an enclosure, that can come later much later, like not 2 in the morning later..
Edit (at not 2 am in the morning): Feed burner made enclosures, of the CC logo. I've shuffled them around and when feedburner updates it should (i hope) make the movie, and not the logo the enclosure.